There are so many pre-workout formulas on the market that it can be hard to know where to start looking. Do you need caffeine or other stimulants? Do you need creatine or citrulline or both? Should you look for something that doesn’t use artificial sweeteners or are you okay with using sucralose in your pre workout? 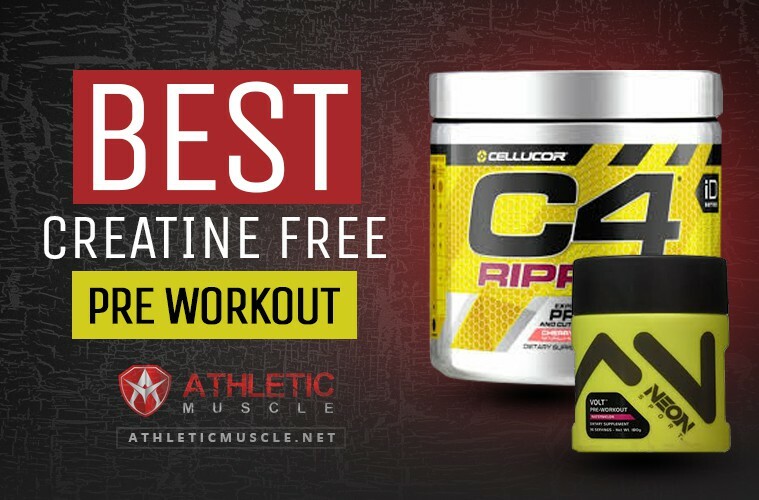 2 What Are the Benefits of a Creatine Free Pre Workout? 3 Why Don’t People Want Creatine in Their Pre Workout? 4 What Ingredients Should You Look For In Your Pre Workout? 5 When Is The Best Time to Take Your Creatine Free Pre Workout? Creatine is the most common ingredient in most pre workout supplements, and is arguably the most studied ingredient on the market. While it can be a useful tool for bodybuilders and people looking to improve their muscle mass, it isn’t the best option for everyone, including people who are training for endurance-related sports like running. Whether you’re training for a marathon or worried about the potential kidney-related side effects, you don’t have to skip your pre workout just because you are avoiding creatine. We’ve reviewed some of the best creatine free pre workouts on the market and will declare a winner at the end of this page. What Are the Benefits of a Creatine Free Pre Workout? Energy boosts — The amino acid blends in creatine free pre workouts are designed to offer natural energy boosts. While they may be paired with caffeine to offer quick boosts as well, you won’t crash as hard after your workout. Fat Loss — Caffeine in creatine free pre workouts has been proven to be an effective fat burner but mixing it with creatine lessens the benefits of the caffeine. Muscle Building and Recovery — Amino acid complexes like BCAA and citrulline have been proven to assist in both muscle growth and post workout muscle recovery. Fewer Side Effects — Common complaints with creatine supplements include dehydration, nausea, weight gain, and even kidney problems. We’ll go into more detail about these side effects in a moment. Thankfully, most manufacturers have realized that creatine isn’t for everyone and have begun offering creatine free pre workouts as part of their overall workout supplement lines. Why Don’t People Want Creatine in Their Pre Workout? Creatine Causes Water Retention — Creatine works by increasing the amount of water that is able to flow into your muscles, leading you to retain water. It can cause weight gain of a few pounds in water weight, as well as making your muscles look mushy and undefined. Not Everyone Responds to Creatine — If you eat a diet that’s high in protein or already produce sufficient quantities of creatine within your own body; you might not get any benefits from an additional creatine supplement at all. Not Body Building — Creatine might be great for bodybuilders but what if you’re not training for lifting? Creatine was found to have no beneficial influence on the cardiovascular system during endurance training. Requires Constant Intake to Be Effective – If you do respond to creatine supplements, you can’t just drink them a couple of times every week before your workouts. To be most effective, you have to take creatine every single day so it builds up an effective concentration in the muscles. Renal Problems — Creatine should be avoided by anyone who has a history of renal (kidney) problems. While there is anecdotal evidence that creatine causes kidney problems, one study found that creatine increases the risk of renal failure in individuals with existing renal problems. Sounds like a lot of hassle for a pre workout that might not even give you the buffs that you’re looking for, right? Creatine has its uses but it’s definitely not the best option for everyone looking for a good pre workout. What Ingredients Should You Look For In Your Pre Workout? Citrulline — Another common ingredient in pre workout supplements. Citrulline is an amino acid that works by making it easier for the body to produce more nitric oxide, a natural vasodilator. Citrulline helps you blood vessels to dilate during exercise, enabling more blood and consequently more oxygen to travel to the muscles that need them most during your workout. It’s ideal for anyone doing any sort of endurance training, but can also be beneficial for strength training as well. Caffeine — This common stimulant is included in a lot of pre workout supplements. As we’ve already mentioned, it’s an effective fat burner, especially in creatine free pre workouts where its effects aren’t muffled by the creatine. Beta-Alanine — Another amino acid that is produced naturally by your body, this supplement ingredient encourages the production of a chemical called carnosine. Carnosine is also produced naturally in your muscles and helps to reduce muscle fatigue during workouts. Betatine — An amino acid naturally found in vegetables like beets, Betatine has been shown to improve endurance and strength. It’s a fairly new supplement through, so we don’t know exactly why it works — yet, anyway! The rest of the ingredients in your creatine free pre workout are likely inactive ingredients — flavors and sweeteners — and those vary so much from product to product that we don’t have enough space to explore them all here. Some creatine free pre workout supplements might show you a ‘proprietary blend’ of ingredients on their nutrition label. It’s a good idea to avoid proprietary blends whenever possible — while you know that you’re getting 2,000mg of their blend, for example, you have no idea what the proportions are for each ingredient. You might have a blend that includes unsafe amounts of caffeine and not even know it because the company relies on a proprietary blend, or your blend might be all filler and not offer any of the benefits that you’re looking for. When Is The Best Time to Take Your Creatine Free Pre Workout? Read the label! We’re just kidding, though your specific creatine free pre workout will have instructions for when you should take their product. In general, though, you’re going to want to mix one to two scoops of your chosen pre workout supplement in 8-16 ounces of cold water between 15 and 30 minutes before you start your workout. Downing your pre workout right before you start lifting isn’t going to do you any good. Depending on how long it takes you to get to the gym, try drinking it before you leave the house so it’s kicked in by the time you are ready to start working out! Now, it’s time to get down to the heart of the matter and the part you’ve probably been waiting for — our product reviews! Here are the reviews for the 5 products we listed at the beginning of this piece. Who will win the title of Best Creatine Free Pre Workout? Read on to find out! If you’re looking for a two stage creatine free pre workout, look no further than Vintage Blast. This pre workout utilizes a unique formula designed to deliver a steady boost throughout your workout rather than a quick boost and a crash later. While it does contain caffeine for that quick boost at the beginning of your workout, the formula of citrulline and other amino acids creates a steady powerful experience that isn’t habit forming. No Proprietary Formula — You see what you get with this pre workout. Each ingredient and measurement is detailed in the nutrition facts. No artificial sweeteners — This pre workout uses stevia instead of artificial sweeteners. Contains Caffeine — Not suitable for anyone who is caffeine sensitive and should not be used late in the day. Lingering Effects — The effect of the two step blend can linger after the workout is complete, making it hard to use for afternoon or evening workouts. One of the biggest benefits of creatine free pre workouts is that it enables the supplements to focus on nitric oxide production. Pulse’s ingredients, which include citrulline and theanine, are designed to give you the best NO2 boost before your workout. When paired with caffeine, this is a great supplement to boost your energy levels, your mood, and your workout performance. It also comes in 4 flavors (Fruit punch, watermelon, grape, and green apple), if you’re the kind of person who needs to mix up their pre workout game a bit. Natural ingredients without a proprietary formula — all ingredients are listed on the nutrition facts with their measurements. Formulated for NO2 boosts — Great for anyone working on their endurance or strength training who needs an extra edge. Natural sweeteners — This pre workout is sweetened with stevia and erythritol. Cost — Pulse is more expensive than some of the other options on our list. Long lasting effects — Effects last for quite a while, might not be the best option for afternoon or evening exercise. Don’t let the neon color turn you off —Neon Sport Volt will get your attention for more than just its garish color. This creatine free pre workout focuses on Beta Alanine as its primary ingredient, along with other amino acids like citrulline and agmatine which is supposed to help improve blood flow to your muscles. While it does come in three flavors (watermelon, electric punch, and berry pomegranate), it also includes some odd ingredients — specifically olive leaf extract, rhodolia, and rauwolfia — which may or may not provide any benefit. Beta alanine — High levels of beta alanine are useful during workouts to reduce lactic acid build up and increase performance. Flavor variety — Pre workout comes in a variety of flavors. Artificial Sweeteners — This pre workout is sweetened with sucralose, and might not be suitable for anyone who is sensitive to artificial sweeteners. Proprietary Blend — Product utilizes a proprietary blend and does not disclose ingredient amounts or caffeine concentration. SizeSlim might sound like a name for a weight loss aid, but it’s actually one of our favorite pre workouts on this list. While it does contain caffeine, one serving contains about 2 cups of coffee worth of caffeine — not too much but enough to get you moving when you’re working out. This pre workout also relies heavily on amino acids — specifically citrulline, beta alanine, and choline — to provide the rest of the boost that you need in the gym. It seems to only come in one flavor, but it does boast all natural flavors and colors and no artificial sweeteners, which is definitely a bonus. No artificial sweeteners — this pre workout is sweetened with stevia. It also doesn’t contain any artificial colors or flavors. No proprietary blend — SizeSlim discloses all of its products ingredients in the nutrition facts. No Crash — caffeine and other ingredients balanced in such a way that you don’t experience a crash after your workout is over. Caffeine — 200mg dose of caffeine per serving might be too much for individual sensitive to stimulants. You can’t do anything in the world of pre workouts without hearing the C4 brand name. C4 Ripped is a combination fat burner and pre workout that comes in two flavors (cherry limeade and fruit punch) and contains both beta alanine and arginine. Other than those two ingredients and some b vitamins, this pre workout is all proprietary blends — the fat burning blend that contains ingredients like green coffee bean extract and cayenne pepper extract, and the energy blend which seems to be mostly caffeine. Multiple flavors — C4 Ripped comes in both cherry limeade and fruit punch flavors. Fat burning formula — works to both provide boosts and burn fat at the same time. Proprietary formula — this supplement has not one but two proprietary formulas as part of its makeup. Artificial sweeteners — this pre workout is sweetened with sucralose and might not be suitable for individuals sensitive to artificial sweeteners. Who comes out on top in our Battle of the Creatine Free Pre Workouts? It was a hard choice, though there are a couple clear losers —we’ll let you make up your mind on those though. Overall, Legion Pulse is our top winner for best creatine free pre workout. Its natural formula is ideal for anyone who wants a good boost without putting a ton of extra chemicals into their body. The only downside we found to pulse was the price — it is a bit on the expensive side but you definitely get what you pay for. If you’re looking for a good natural pre workout without the sucralose or other artificial sweeteners that gets you the boosts you’re looking for without a crash later, than Legion Pulse is the product for you, and clearly the winner of best creatine free pre workout supplement.